GIVEAWAY: Fingerprint Pendant from Tina Steinberg!!! - I Can Teach My Child! GIVEAWAY: Fingerprint Pendant from Tina Steinberg!!! I only wear jewelry that has meaning to me. I wear three pieces of jewelry nearly every day…my wedding ring, an opal ring from my grandmother, and a fingerprint necklace that was made when Big Brother was 5 months old. I ordered my first necklace from Tina Steinberg two years ago after my friend Kristen got one with her daughter’s fingerprint. And because I wanted another one for Little Brother, I just ordered my second (the “Love Squared” Design). When you place an order on Tina’s website, she mails a fingerprint kit. The kit includes clay for the mold and specific directions for acquiring a fingerprint. Once you follow the instructions, you send the mold back to Tina and she creates a one-of-a-kind piece of jewelry with the fingerprint of your little pride and joy! As I said, I wear my necklace nearly every day and I absolutely LOVE IT. I am terrible about taking jewelry off…so it even gets worn in the shower (which I’m not sure Tina would necessarily approve of–but it hasn’t damaged it a bit). Big Brother’s name and birth date are inscribed on the back of the necklace–making it that much more personal. It is a piece of jewelry I will treasure for the rest of my life and I’m so glad I’ll get to add Little Brother’s fingerprint to the necklace as well! When I started this website, I tried to think of “parent products” that I love and could ultimately share with you. The first on my list of favorites was my fingerprint necklace, so I contacted Tina and she was so gracious to offer one of her amazing pendants for a giveaway. The winner will receive a Round Up My Love pendant (valued at $135). This sterling-silver pendant includes an imprint of your child’s fingerprint plus 2-4 mm of border space around the print. It also includes a two word inscription on back and a jump ring. It does not include a chain. 1. Follow me on this website or subscribe via e-mail, then leave a comment saying you have followed or subscribed. If you are already a follower or already subscribe, leave a comment telling me that as well. 2. “Like” I CAN TEACH MY CHILD on Facebook and leave a comment telling me you did this. Again, if you previously done this, you still qualify. 3. “Like” TINA STEINBERG DESIGNS on Facebook and leave a comment telling me you did this. 4. Visit Tina’s website and leave a comment telling me what your favorite piece of jewelry is. 5. 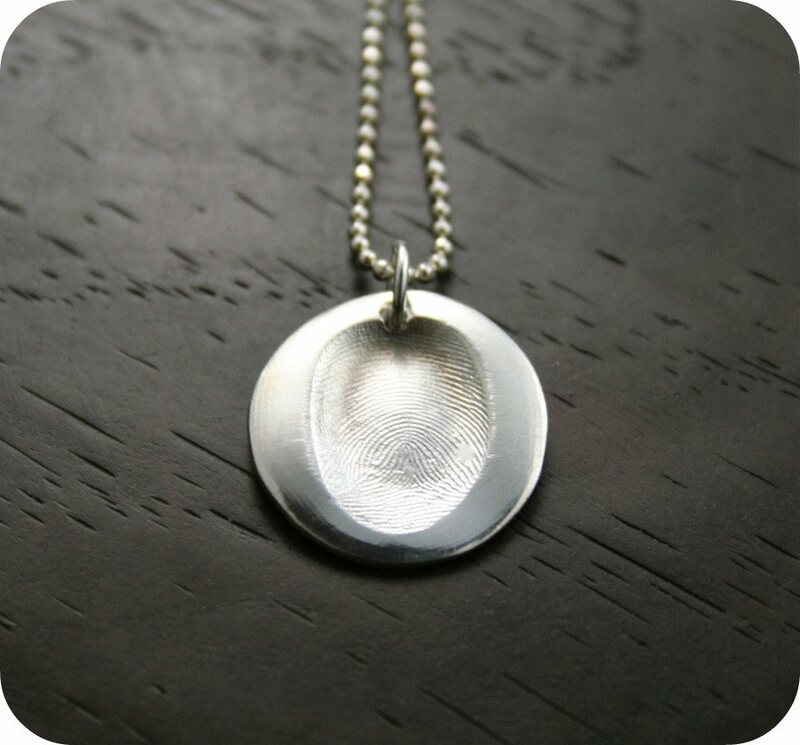 Finally, copy and paste this message as your Facebook status: I just entered to win fingerprint pendant from Tina Steinberg Designs through I Can Teach My Child–a website for parents of children ages birth through 5 years. You can enter too! Just go to https://www.icanteachmychild.com/. Remember…leave a separate comment for EACH ENTRY. After 48 hours (Thursday morning at 10am), I will randomly draw a winner. Good luck! If you do not win the giveaway but still want to purchase one of her beautiful pieces of jewelry, Tina has offered free shipping using the code “freeship”, good through August 6th. 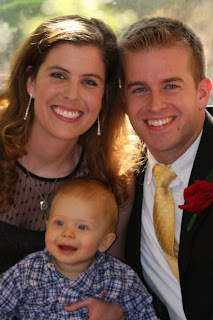 And here is a picture of our family (prior to Little Brother) at my cousin’s wedding. You can see I am sporting my favorite necklace…which can be found in nearly every picture I have of myself because I always have it on! checked out her website–love the side by side and love drop double! I "liked" y'all on facebook! I'm a subscriber to your site. My kids are the same age as yours, so I really relate to your posts! My fav piece of jewelry is the name lockets. Even if I don't win, I will keep Tina in mind when I'm ready to order a "mommy" necklace. Love them all! I like Tina on FB. I like the Two Tier Little Love Charmer. I posted the giveaway to my status on FB. I "like" Tina Steinberg Designs on Facebook. My favorite piece of jewelry on Tina's website is the Joan of Arc pendant. It's the one that says "I'm not afraid. I was born to do this." Awesome. I really like the glass lockets that Tina has on her website. I LOVE the Puppy Love Charm from the Love Touch Collection! I want one for my Husband who is currently deployed! I liked I can teach my child on FB! I liked Tina Steinburg Designs on FB! I 'like' Tina Steinberg Designs. I love the Words Locket. SO cute! My status update in FB is about the entry! :) Love that I found your site. Thanks so much for the great ideas! I'm an avid follower of your blog! I "liked" Tina's designs on FB! I "like" Tina on FB. I changed my status on FB. I'm a follower (have been for a couple months)and I love all your great ideas! I think my favorite is the Joan of Arc Round necklace. So many beautiful pieces on Tina's site but my favorite is the 'Love Locker' Heart Locket. I'm a private Google follower. I like you an FB. I like you even better in real life!! I like Tina's Design on FB. Wow! These are really cool! My favorite is the Love Touch Locket. Beautiful! Copy and Pasted!! Thanks Jenae! I like Tina Steinberg Designs on Facebook! I like the Little Love Charmer Plus & Diamond Love fingerprint pendants. So sweet – great idea! I am an email subscriber. I really enjoy your blog! I "Like" I Can Teach My Child on fb. I like Tina Steinburg designs on FB. My favorite items of Tina's are her fingerprint charms shaped as hearts! I 'like' Tina Steinberg designs on facebook! I like your facebook page too! I like Tina's luscious lockets with the names inside-so sweet! I updated my facebook status, thanks Jenae! I changed my status to get the word out!! I looked around her website and love the word/name lockets! what a wonderful idea! Round up my love is my favorite of her pieces. I like the word/name locket on her website . . . although I don't like anything as well as the Round Up my Love pendant you are offering as your giveaway . . . what an amazing idea. I follow your blog and I really like all the great ideas you share! Keep it up! I like Tina's page on Facebook too! I just liked you on facebook. I just found your website and I love it . . . and I REALLY LOVE this giveaway . . . I hope I win. :-) Thanks for all you do. I like the lockets with the names in them on Tina's website. I liked "I can teach my child" on FB! I'm following you on blogger. My favorite piece has to be the little love charmers…. so cute! I am now a fan of 'I Can Teach My Child' on FB. I am a fan of Tina Steinberg Designs on FB. I just subscribed. Thank you for providing some new ideas. My son just turned 3 and my daughter is 8 months old, so I am thrilled to have found you. Thanks!!! I also just 'liked' you on FB!!! I already 'like' Tina's designs/site on Facebook and would do it again if I could! I copied & pasted the message to my status. I am sure some of my SAH mommy friends will soon be followers of your site too! I subscribed to I can teach my child via email and like your page on Facebook. I have been a fan of Tina Steinberg Designs on Facebook for a while….love her work! Great site you have also! Favorite piece is the "Round Up My Love Double Print (Two Print)"
Trying to figure out how to post my comment correctly….the above comment is from me. My favorite piece is a toss up between the Round Up My Love and the key chain Love Touch. I think they are both great pieces. I am a new follower. I have a special love touch thumbprint heart necklace of my husband's thumbprint. It is a beautiful work of art that I will cherish a lifetime. I love the mini loves.. perfect for my 2 little fingerprints!! Would love to wear one of these!! I am a friend and like Tina Steinberg Designs on Facebook. My favorite piece has to be my heart necklace with my husband's thumbprint which is posted on Tina's website. I already like Tina on Facebook. The round up my love is my favorite piece. I had one for my older daughter, the chain broke last fall and I lost it, I'm still heartbroken about it and tear up just thinking about the fact that it is gone. I have a couple of posts about the pendant on my blog, including the process of making it and size comparison pictures. I need to get two new ones now, one to replace the lost one and one for my 3 month old. I posted the giveaway as my Facebook status. I liked I can teach my child on facebook! Round Up My Love is my fav! I liked Tine Steinberg designs! I am a follower of your website! My favorite is the circle locket with the two names in it! I told everyone that I entered into this giveaway! My favorite piece of Jewelery from Tina is her Joan of Arc pendant "I am not affraid I was born to do this". It inspires me! I like everything on her site, but I really like the Round Up My Love item, too! I am now a follower on your website, what a great giveaway. I am now a friend of your Facebook page, so excited about the giveaway. My favorite design on Tina Steinberg's website is the "You are Loved" necklace. I have reposted the giveaway notice on my FB page. i already liked tina on fb (which is how i found you). i updated my fb status. I love the round up my love pendant, which is featured for this giveaway, and my other favorite items would have to be the luckiest charms with one engraved initial, and the lockets.There are so many sweet items to choose from. I would love to win!! Thanks for the opportunity! Entry 2 – for the contest – I LIKE I CAN TEACH MY CHILD on Facebook. Entry 3 – for the contest – I LIKE TINA STEINBERG DESIGNS on Facebook. Entry 4 – for the contest – I like the word/name locket best of all. But all of her things are wonderful. I hope to order something sometime. I really hope I win this! Entry 5 – for the contest :) Last one :) I copied the phrase and put it in my Facebook status. It's there now. I am following you via email! I am in love with the word/name locket and the round up my love – they're all gorgeous!! Gemstone & Silver Bracelet with Little Love Charmer Fingerprints. I am a Liker of your FB page. My favorite piece on Tina's page is the Love Touch Locket. Love it!! And I did copy and Paste the giveaway to my facebook page. I follow your website & love it !!! I added your blog to my favorites. i think your blog is great, i wish i had stumbled on it sooner! i love the thumb/finger print pendent!!! I liked Tina on facebook! I love the 'Circle of Life' Locket! I like Tina Steinberg on facebook. My fav TS is Round Up My Love! gotta have that one :) thanks! Of course, I love the round up my love pendant! I also like her Joan of Arc pendant! I "liked" Tina on fb. My favorite one is the Love Squared! I added it as my status. Thanks for the chance to win this necklace! I just found our blog tonight and I am pretty excited about reading more of your ideas! 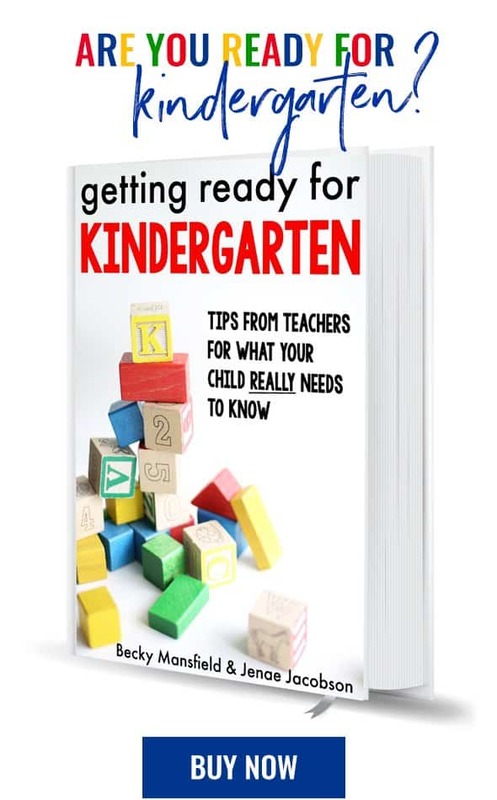 I have liked "I can teach my child" on facebook! I follow your website! Just found it and LOVE the fun, creative and encouraging ideas you have! I liked Tina S. on facebook! I copy and pasted the status about entering on facebook! Whoo hoo! My favorite piece on Tina's jewelry is the Little Love Charmer Plus. Such cute stuff! I follow your blog and really enjoy all of the wonderful ideas to use with little ones. Thanks for sharing your ideas! I love the word/name locket Tina has on her site! I visited Tina's website, and I really like the "Love Squared" pendent. Besides her great personalized items, I really loved the Found My Way pendant! It would be a perfect anniversary gift! Liked you on facebook (Beth with full last name) – email with questions. Liked Tina Steinberg Designs on Facebook too! I posted the message as my facebook status on my blog's page since it should have more visitor's that would come and enter with the link-ups! I previously "liked" I Can Teach My Child on facebook. I just added Tina Steinberg Designs to the things I "like" on facebook. And…my favorite piece of Tina's is the Love Squared necklace! I just subscribed–love the ideas! I might be too late – but I just found your awesome blog! I am now a fan on facebook! I like the Love Touch locket! Funny Photo Contest: Vote for your Favorite!